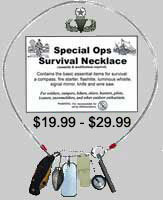 There are two types of compasses, (a) liquid filled and (b) non-liquid filled. 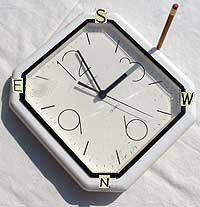 Liquid filled means the compass is filled with some special liquid so the magnetic needle floats freely inside of it. Non-liquid filled means there's no liquid inside of it (duh?) 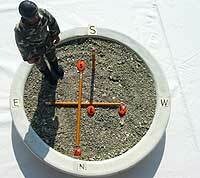 but instead the magnetic needle is able to rotate freely while being balanced on one or two pins inside the compass. So which is better? They both have their pros and cons, the only difference is that the North seeking magnetic needles inside liquid filled compasses rotate & move slower than non-liquid filled compasses. But regardless of which type of generl direction compass you have or get with your survival kit, they're a lot more easier to use in determining directions than these techniques below "without a compass." Step 1: Try to find some flat level area with very little or no vegetation at all. Step 2: Place a straight stick upright into the ground and find the stick's shadow. 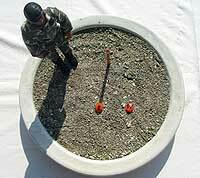 Step 3: Now place your 1st rock at the tip of the stick's shadow, this is your "West"mark. Step 4: Wait approximately 15, 20 or 30 minutes for the stick's shadow to move a few inches. 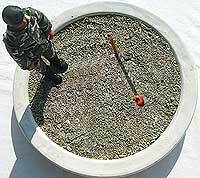 Step 5: Now place another rock at the tip of this other stick's shadow, this is your "East" mark. Step 6: Now draw a straight line or place a straight stick from your "East" rock to your "West" rock. Step 7: And now draw another straight line or place another straight stick across your "East-to-West" line/stick and this is now your "North-South" line/stick. Note: The instructions listed above is for the Northern hemisphere, for the Southern hemisphere the only difference is that North and South are reversed, East and West remain the same. 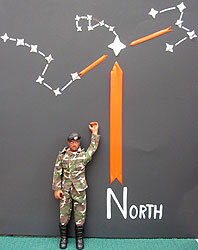 Step 2: North is located halfway between 12 O'clock and the "hour hand." 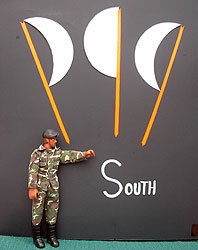 South is in the opposite direction. 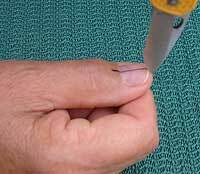 Step 1: Place a sharp pointed knife vertically on your thumb nail. Step 2: Look closely at your thumb nail and find the lightly cast knife shadow. Step 3: Now rotate your entire body until the lightly cast knife shadow is at it's thinnest. 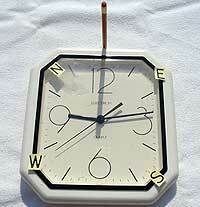 you will be facing a Southernly direction, and in the afternoon you will be facing a Westernly direction. Note: Though this method is less accurate than the other two methods. But if you don't have a compass or any sunlight it's hellova lot better than flipping a coin in determing a direction, don't ya think? Remember if you're located in the Southern hemisphere "South" and "North" are reversed. 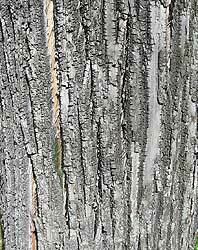 In the Northern hemisphere trees with thick, rough, linear bark, the up & down grain lines are usually wider on the South side and tighter on North side. 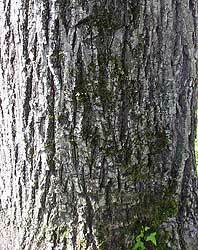 In the Northen hemisphere moss found near the base of trees usually grows on the Northern side where the sun's rays don't reach. Again, if you are located in the Southern hemisphere remember that "South" and "North" are reversed.